Are you ready to finally fix up that bathroom after all the years of wear and use? Perhaps, though, you’re asking yourself how to redo a bathroom without taking a financial bath yourself. Here are some cheap bathroom makeovers that you may find of help. Hope you find some inspiration and information in this post on bathroom decorating ideas on a budget. 1. If budgeting is a consideration, maybe the best place to start, as with any remodeling project, is the budget. The type of materials you select and the boundaries of your design will be guided by a sound assessment of your budget. If you have a sound and realistic idea of what you can afford it will be a lot easier to decide what you can replace and where you’ll have to be creative. 2. There’s much buzz these days about eco-friendly approaches. Aside of all claims about the virtues of doing so for the environment, going green can have big payoffs for you. Eco-friendly products have great design, may function better, lowering utility bills, and if they’re chemical-free that can have benefits for the health of your family. Though, be aware, an eco-friendly approach to remodeling isn’t just about buying green products, making more conservative choices, such as painting a cabinet instead of tossing it in a landfill, goes a long way in this direction, too. 4. A really important approach to keep your budget under control is to not move your plumbing. Trading the places of where your sink and toilet are in the bathroom only looks easy if you’re thinking of it as mere furniture. Of course, though, they’re not: the problem lies underneath and all the costs involved in moving that plumbing. Instead, spend less money on relocating fixtures and you’ll have more money to spend on that great new shower system that you want to add. 5. A little honest self-criticism can also save a tone of money. Brutal honesty about your DIY skill’s may wound the pride a little, but it’ll spare the pocket book a lot. Only once you have a realistic picture of what is possible and practical as do it yourself projects will you really know which will actually save you money by being left to a professional. You’ll save yourself a bundle by having a professional do from the start something that you mess up and call him in later to fix. See the HIR advice on hiring contractors. 6. In terms of bang for your buck, some of the best fixes in a bathroom can also be the easiest and the cheapest. Replacing the hardware, such as drawer pulls and cabinet knobs (see here), faucet handles and showerheads (see here), can have a huge impact on the feel of the bathroom for a minimal investment. Be sure though to use the same finish – e.g., stainless steel, aged bronze or brushed nickel. This will give the room a cohesive look. 7. People often underestimate the importance of lighting in a bathroom. 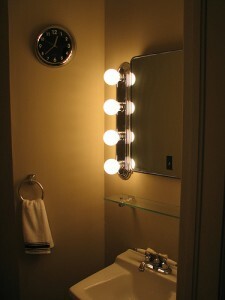 Sconce lighting at the vanity provides appealing, even lighting on your face. Install it at eye level to diminish unflattering shadows. If you can put in a dimmer, it provides a relaxing ambiance for your bath and is less hard on the eyes during a middle of the night run to the bathroom. On the other hand, bright lights are best for shaving or applying makeup. Furthermore, adding more lighting can make a small bathroom seem larger even while increasing its utility. 8. Finally, don’t overlook the importance of ventilation. Moisture is a terrible villain for your bathroom. All your great renovating work will be quickly undermined by the growth and spread of mold and mildew if you’re not careful to prevent it. Install a vent fan of appropriate CFMs for the square footage of your bathroom. The rule of thumb is that one CFM is needed per square foot for bathrooms of one hundred square feet or smaller. Hope these ideas on how to redo a bathroom have helped you find some cheap bathroom makeovers that work for your home. If you plan smart there’s no reason you can’t have great results from these bathroom decorating ideas on a budget.